Explained: How does a soccer ball swerve? It happens every four years: The World Cup begins and some of the world's most skilled players carefully line up free kicks, take aim—and shoot way over the goal. The players are all trying to bend the ball into a top corner of the goal, often over a wall of defensive players and away from the reach of a lunging goalkeeper. Yet when such shots go awry in the World Cup, a blame game usually sets in. Players, fans, and pundits all suggest that the new official tournament ball, introduced every four years, is the cause. Many of the people saying that may be seeking excuses. And yet scholars think that subtle variations among soccer balls really do affect how they fly. Specifically, researchers increasingly believe that one variable really does differentiate soccer balls: their surfaces. It is harder to control a smother ball, such as the much-discussed "Jabulani" used at the 2010 World Cup. 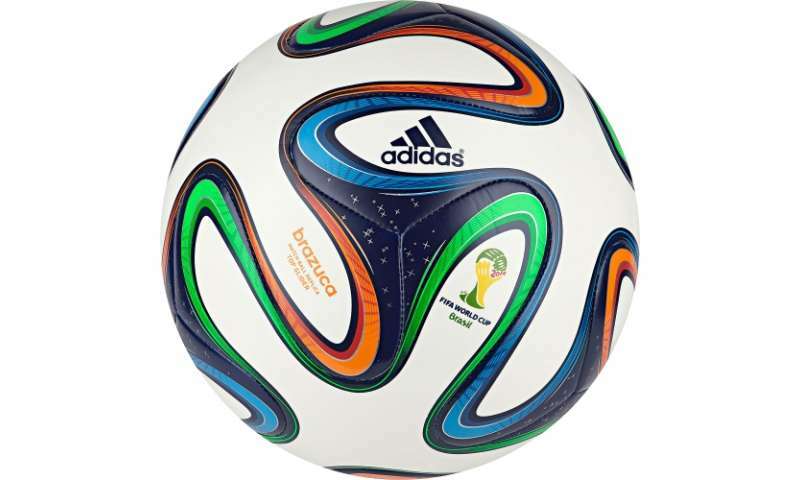 The new ball used at this year's tournament in Brazil, the "Brazuca," has a slightly rougher surface, and may be more predictable. "The details of the flow of air around the ball are complicated, and in particular they depend on how rough the ball is," says John Bush, a professor of applied mathematics at MIT and the author of a recently published article about the aerodynamics of soccer balls. "If the ball is perfectly smooth, it bends the wrong way." By the "wrong way," Bush means that two otherwise similar balls struck precisely the same way, by the same player, can actually curve in opposite directions, depending on the surface of those balls. Sound surprising? It may, because the question of how a spinning ball curves in flight would seem to have a textbook answer: the Magnus Effect. This phenomenon was first described by Isaac Newton, who noticed that in tennis, topspin causes a ball to dip, while backspin flattens out its trajectory. A curveball in baseball is another example from sports: A pitcher throws the ball with especially tight topspin, or sidespin rotation, and the ball curves in the direction of the spin. In soccer, the same thing usually occurs with free kicks, corner kicks, crosses from the wings, and other kinds of passes or shots: The player kicking the ball applies spin during contact, creating rotation that makes the ball curve. For a right-footed player, the "natural" technique is to brush toward the outside of the ball, creating a shot or pass with a right-to-left hook; a left-footed player's "natural" shot will curl left-to-right. So far, so intuitive: Soccer fans can probably conjure the image of stars like Lionel Messi Andrea Pirlo, or Marta, a superstar of women's soccer, doing this. But this kind of shot—the Brazilians call it the "chute de curva"—depends on a ball with some surface roughness. Without that, this classic piece of the soccer player's arsenal goes away, as Bush points out in his article, "The Aerodynamics of the Beautiful Game," from the volume "Sports Physics," published by Les Editions de L'Ecole Polytechnique in France. "The fact is that the Magnus Effect can change sign," Bush says. "People don't generally appreciate that fact." Given an absolutely smooth ball, the direction of the curve may reverse: The same kicking motion will not produce a shot or pass curving in a right-to-left direction, but in a left-to-right direction. Why is this? Bush says it is due to the way the surface of the ball creates motion at the "boundary layer" between the spinning ball and the air. The rougher the ball, the easier it is to create the textbook version of the Magnus Effect, with a "positive" sign: The ball curves in the expected direction. "The boundary layer can be laminar, which is smoothly flowing, or turbulent, in which case you have eddies," Bush says. "The boundary layer is changing from laminar to turbulent at different spots according to how quickly the ball is spinning. Where that transition arises is influenced by the surface roughness, the stitching of the ball. If you change the patterning of the panels, the transition points move, and the pressure distribution changes." The Magnus Effect can then have a "negative" sign. From Brazil: The "dove without wings"
If the reversing of the Magnus Effect has largely eluded detection, of course, that is because soccer balls are not absolutely smooth—but they have been moving in that direction over time. While other sports, such as baseball and cricket, have strict rules about the stitching on the ball, soccer does not, and advances in technology have given balls sleeker, smoother designs. There is actually a bit more to the story, however, since sometimes players will strike balls so as to give them very little spin—the equivalent of a knuckleball in baseball. In this case, the ball flutters unpredictably from side to side. Brazilians have a name for this: the "pombo sem asa," or "dove without wings." In this case, Bush says, "The peculiar motion of a fluttering free kick arises because the points of boundary-layer transition are different on opposite sides of the ball." Because the ball has no initial spin, the motion of the surrounding air has more of an effect on the ball's flight: "A ball that's knuckling … is moving in response to the pressure distribution, which is constantly changing." Indeed, a free kick Pirlo took in Italy's match against England on Saturday, which fooled the goalkeeper but hit the crossbar, demonstrated this kind of action. Bush's own interest in the subject arises from being a lifelong soccer player and fan—the kind who, sitting in his office, will summon up clips of the best free-kick takers he's seen. These include Juninho Pernambucano, a Brazilian midfielder who played at the 2006 World Cup, and Sinisa Mihajlovic, a Serbian defender of the 1990s. And Bush happily plays a clip of Brazilian fullback Roberto Carlos' famous free kick from a 1997 match against France, where the player used the outside of his left foot—but deployed the "positive" Magnus Effect—to score on an outrageously bending free kick. "That was by far the best free kick ever taken," Bush says. Putting on his professor's hat for a moment, he adds: "I think it's important to encourage people to try to understand everything. Even in the most commonplace things, there is subtle and interesting physics."